Many of today's best Twitter management applications--from TweetDeck to HootSuite to Seesmic Desktop--take up a good portion of your desktop real estate. If you're looking for something a little smaller, consider Blu. Developed as a concept application for Windows 7, Blu is a slick little Twitter client that leaves you with plenty of room to get some work done. Blu lets you see @replies and mentions in a conversation view, which makes it easier to understand them in context. Blu's rectangular shape is reminiscent of the dedicated AIM client I've always relied on for instant messaging. But is attractive interface is far superior: It features a muted blue and white design that manages to look both simple and sophisticated at the same time. Blu's default display shows you Twitter timeline, while icons at the bottom of the Blu client make it easy to view @mentions, favorites, retweets, direct messages, and your own Tweets. I especially like how Blu lets you see @replies and mentions in a conversation view, which makes it easier to understand them in context. It's a handy feature. Additional icons let you access Twitter search and compose new tweets. Blu's singular column design means that you can only view one of these categories of information at a time. Rival TweetDeck, meanwhile, features a multi-column design that lets you view multiple information streams at once. This omission is the trade-off for Blu's slim footprint, though, and it's one that I'm willing to take. Blu's social media support is limited to Twitter, and this app only allows you to manage one Twitter account. If you can live with those limitations, you'll find that Blu is a whole lot more than just a pretty face. Note: The Download link takes you to the vendor's site, where you can download the latest version of the software. 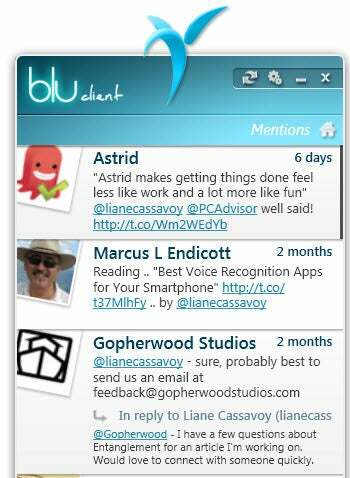 Blu is a small but slick desktop client for managing your Twitter account.